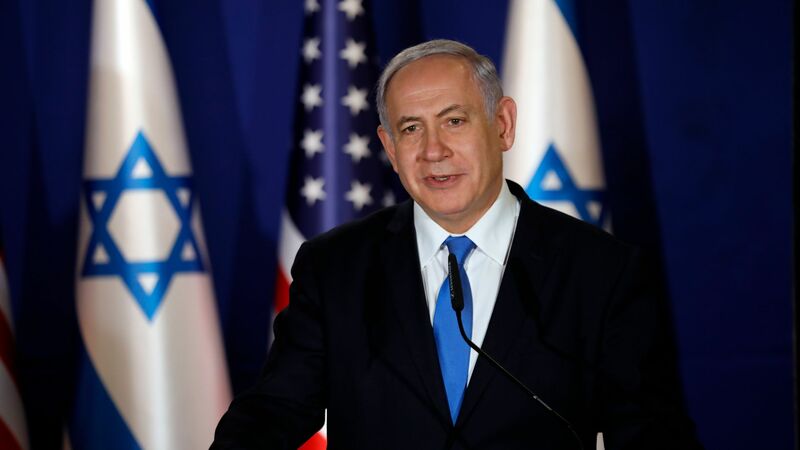 Netanyahu’s re-election campaign is coming to D.C.
Israeli Prime Minister Benjamin Netanyahu is coming to Washington next week to meet with President Trump and speak at the annual policy conference of AIPAC, the pro-Israel lobbying group. Why it matters: Beyond the official reasons for Netanyahu's trip, the embrace of Trump and other American supporters could be valuable to his political prospects. With an election only two weeks away, Netanyahu faces serious legal challenges and is behind in the polls — perhaps his most precarious electoral position in decades. Context: The visit comes at a divisive moment around Israel among Democrats, highlighted by sparring between Rep. Ilhan Omar and senior Democratic lawmakers over her comments on the motivations of Israel supporters. Trump has exploited this dynamic, labeling the Democratic party “anti-Jewish,” even though 79% of Jews voted Democratic in 2018. Watch for Netanyahu to back him, putting Democrats further on the defensive. Netanyahu's AIPAC speech is likely to focus on the Boycott, Divestment and Sanctions movement — the group's top priority, after military aid to Israel and constraints on Iran. He may emphasize Israel's greater acceptance in the Arab world, but don’t expect much fanfare about the Palestinian issue. Flashback: In March 2015, Netanyahu addressed a joint session of Congress and attacked President Barack Obama’s Iran diplomacy. That speech similarly doubled as a campaign ad for his re-election to the premiership. Iran continues to expand its reach in Iraq, Syria and Lebanon. The Trump administration’s attempt to isolate Iran by withdrawing from the nuclear deal has been ineffective at best; by undermining alliances, it's left the U.S. and Israel more alone in their efforts. Syria is dominated by Russia and Iran, with Assad firmly in power. Trump’s Golan Heights decision will create new tensions as military activity between Israel and Iran continues. Jared Kushner's peace plan has no support from the Palestinians. While that will not advance Israel's long-term security, Netanyahu may benefit in the meantime, as his coalition partners panicked over reports Kushner could address “borders.” Now that Netanyahu has secured his most significant near-term ask — American recognition of Jerusalem as Israel’s capital — prospects for two-state peacemaking under his leadership are dim. The bottom line: Netanyahu's visit will likely do little to resolve Israel's most pressing security concerns, and could instead prioritize his political survival over policy.